I am the song that's playing on repeat, over and over again ending the last note only to begin again on the first. I can't help but play and play again this song of gratitude, though. It's been such a rough year. and that He never forsakes those who seek Him. "Before you make your Christmas list make your Thanksgiving list." And so I write them down, one by one, giving thanks, making my Thanksgiving list, playing my same song, a broken record of praise. Join us for #BPCaptures! Each Wednesday we upload our pictures to instagram and follow the hashtag to find each other's captures. 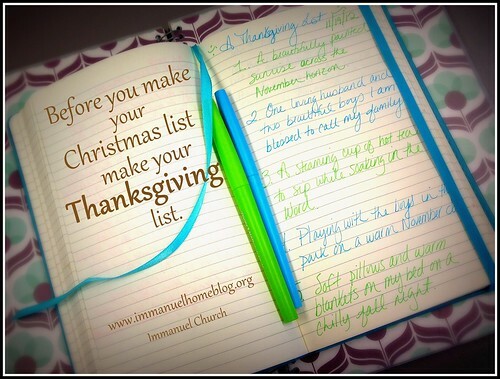 "Before you make your Christmas list make your Thanksgiving list." Love it! A timely reminder to keep our priorities straight this holiday season. such an important reminder - especially this time of year when we tend to overload with busy busy!